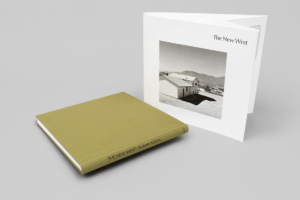 The statement by Baltz, who, like Robert Adams (1937-) wrote extensively about photography, is interesting because he wanted to return to the initial or founding use of the camera in that what it produced would be a record, a document made by a mechanical device. The photographer was or is merely the human who is instrumental in pushing a button. But the “powers of observation and description” were key in that these terms imply discretion and choice on the part of the photographer who is the observer and is the one who points the eye of the camera, guiding the lens to a particular location which will be framed for capture. Supposedly, the new topographics photographer would eliminate the imagination and personal prejudice, but, when the various artists in the movement are examined, it is clear that each has an individual approach that is distinct and identifiable. Frank Gohlke, for example, would photograph his sites from extreme distances. In fact, Gohlke is usually so detached from the landscapes that when he frames a close-up so to speak, it is a shock to the eye. Much of his frame would be habitually taken up by emptiness and negative space which would become the compositional dominant overtaking the supposed focal point. Likewise, it is impossible to confuse Lewis Baltz with his colleague Robert Adams. Baltz seemed attracted to places in transition, existing for a few weeks in a liminal space and fluid time: today the land is like “this,” tomorrow it will be “that” but we never see the outcome and the land is frozen in process. Adams, in contrast, was more interested in the outcome. Outcomes fill his frames. While some might wince at the depressing results, the photographer remarked that “all land, no matter what has happened to it, has over it a grace, an absolutely persistent beauty.” But is this beauty a memory of a distant past or an acceptance of a new definition of “beauty” in an age of conformity? As discussed in earlier posts, the New Topographic movement was, for the most part, concentrated in the modern West, not the East, but the frontier territory, a legendary locale of lore now relegated to pulp fiction and old movies. The West as the new Garden of Eden or the refuge of those on the run to their next lives has a unique role in American history. On one hand, the government and corporations and the military teamed up to conquer, subdue, settle and develop land considered “virgin.” This land was either given away or at very low prices to those willing to “civilize’ it and the Army was deployed to sweep the original inhabitants in to “reservations” or land “reserved” for them. But, on the other hand, Manifest Destiny had its cost and the price was the loss of the dream of renewal. No longer was the West a goal that beckoned to those who needed redemption. By the end of the twentieth century, it was left-over land, land to be developed a hundred years after the original invasions, or it was set aside land, worthless land to be used by the government for its weapons testing. 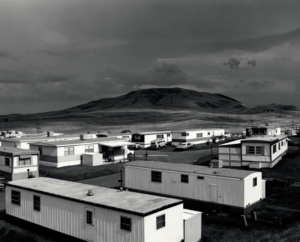 The task of Robert Adams was to observe the benign and banal suburbanization of The New West. In his 1974 book, the photographer shows emptiness that then fills. Homes, from trailers to suburban boxes are moved to a grid into contemporary settlements that are consequently given a name, transforming empty space into a filled place. Overlaying the web of streets lined with one story ranch-style homes is a feeling of nostalgia and a sense of history as a backdrop, framing the images of the untouched stretches of desert and mountain lands, photographed by Timothy O’Sullivan and Willliam Henry Jackson. In 2010 the Los Angeles County Museum of Art restaged the original 1975 exhibition, and, looking back almost forty years later, it seemed clear that the work of these artists was symptomatic of a coming wave of altering the landscape. As writer Christy Lange noted for Frieze, “It’s remarkable to see how presciently ‘New Topographics’ captured the alarming, burgeoning aspects of American land use that would soon become endemic throughout the nation, calling for sociological concern not just aesthetic attention.” In point of fact, The New West is cataloged in libraries under, not art, but sociology. it is the collective memory of the “Wild West” that empowers The New West. Although the name of Ed Ruscha and his many small books, such as the 1963 work, Twentysix Gasoline Stations, is often evoked in relation to the New Topographics group of photographers, his work is not cast against the backdrop of Western “scenery” or of landscape painting. Ruscha’s gas stations were about the road, about traveling, about the journey along route 66 between the Midwest and Los Angeles, a migratory route. Turning the pages from station to station does not involve a vague mourning, but rather a sense of the familiar needs of the driver before the time of freeways. 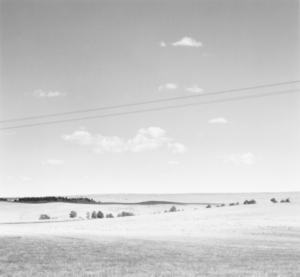 In addition, the name of Walker Evans is also often brought forward as a precursor of New Topographics, but only rarely do we see the flat and truncated approach of the early photographer. It should be pointed out that it is far more apt to use Evans in relation to Robert Frank. Both were strangers in a strange land. Evans was a northeasterner, roaming the unfamiliar South, regarding this alien region with the eye of the curious foreigner, seen twenty years later in Frank’s The Americans. Evans, who preferred strongly structured close-ups, used the faces of buildings, often covered with text, signs, lettering, and other forms of messaging, as an almost abstract composition by Mondrian. The New Topographics artists seek open space and study how it is covered up. What they are gazing upon is the built environment, acts of architecture; what Evan photographed with his closely framed straight-arrow view camera was semiotics. The New West is laid out as a narrative journey. 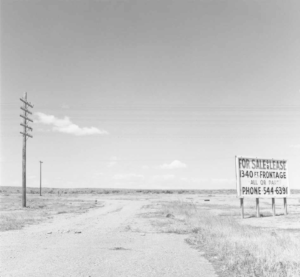 The book begins with a flat and otherwise nondescript view from the side of an empty road, flanked by a lone telephone, supporting two wires. Clearly, this is settled land–the telephone must connect with someone. The shadow of a tree points its triangular shape into the right side of the frame and is echoed by the wedge of leaves pushing into the top right corner. The the next image picks up another dual telephone wire, asserting itself over an otherwise untouched landscape of hills, rolling slightly. A horizontal row of trees peeks above the crest of the closest rise as if watching the viewer approach. The third photograph is a preview of the forth. A lonely low rusted sign, its purpose obliterated by wind and weather, punctures the hard dry ground. Far beyond in the dim distance, a torn edge of a mountain range ends the apparently endless and unmarked terrain. The fourth image is all about real estate. The sign marks the desert, announcing that it is owned and will be sold. This is “frontage” property, the sign asserts as an elaborate tiered telephone pole, with five crossbars, promises connection with the outside world. The fifth photograph is a dead rabbit, a warning that is both stark and ambivalent. 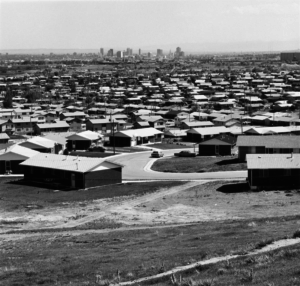 The rest of the book marches the reader out of the empty desert into the suburbs, made of mobile homes and packed developments that are perhaps “towns.” From these fringes, the houses become more “mature,” indicating that they have been built earlier than those at the far edge. Then comes the city, the heart of and the inspiration for the expansion of the settlements. The city supports the outlying neighborhoods and the inhabitants support the city. The relationship is reciprocal, inspiring the erection of small skyscrapers and a variety of drive-in services. Suddenly The New West veers back to the desert edges, what is left over, perhaps awaiting further development. And beyond, as the book comes to an end, lie the mountains, that which may or may not be impervious to the blandishments of developers.